Women may carry mutated copies of mitochondrial DNA (mtDNA) -- a molecule that describes how to build important cellular machinery relating to cellular energy supply. If this mutant mtDNA is passed on to that woman's child, the child may develop a mitochondrial disease, which are often degenerative, fatal, and incurable. 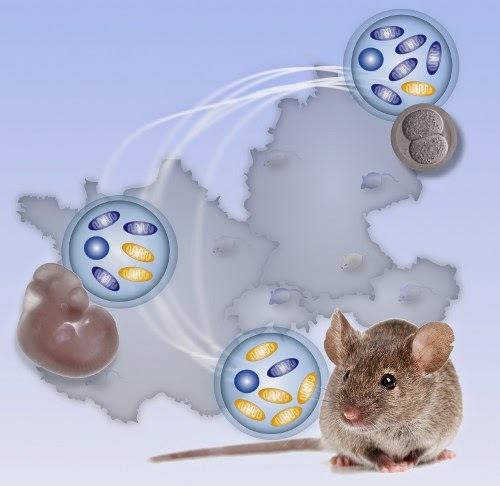 Joerg created mice that contained two types of mtDNA -- here illustrated as blue (lab mouse mtDNA) and yellow (mtDNA from a mouse from a wild population). We used several different wild mice from across Europe to represent the mtDNA diversity one may find in a human population. 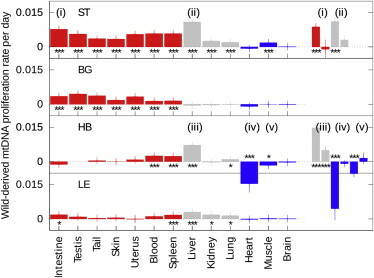 We found that throughout a mouse's lifetime, one mtDNA type often outcompetes another (here, yellow beats blue), with different patterns across different tissues. Amazing new therapies potentially allow a carrier mother A and a father B to use another woman C's egg cells to conceive a baby without much of mother A's mtDNA being present. The approach involves taking nuclear DNA content from A and B (so that most of the child's features are inherited from the true mother and father), and placing it into C's egg cells, which contain a background of healthy mtDNA. You can read about, what are misleadingly called, three-parent babies here. Something that is less discussed is that, in this process, a small amount of A's mutant mtDNA can be "carried over" into C's cell. If this small amount remains small through the child's life, there is no danger of disease, as the larger amount of healthy C mtDNA will allow the child's cell to function normally. We can think of the resulting situation as a competition between A and C -- if A and C are evenly matched, the small amount of A will remain small; if C beats A, the small amount of A will disappear with time; and if A beats C, the small amount of A will increase and may eventually come to dominate over C.
Until recently it has been fair to assume that A and C are always about evenly matched (unless something is drastically different between A or C). However, evidence for this idea was based on model organisms in laboratories, which do not have the same amount of genetic diversity as found in human populations. Our collaborator Joerg addressed this by capturing wild mice from across central Europe, selecting a set that showed a comparable degree of genetic diversity to that expected in a human population. He used these, with our modelling and mathematical analysis, to show that pronounced differences between A and C often exist, and are more likely in more diverse populations. The possibility that A beats C, and mutant mtDNA comes to dominate the child's cells, therefore cannot be immediately discounted in a diverse population. We propose "haplotype matching" -- ensuring that A and C are as similar as possible -- to ameliorate this potential risk. It's open as to whether one can generalize from observations in mice to people and it's also open as to whether our conclusions, which used lab-mice as parent A (which are not entirely typical creatures) of necessity generalize to other non-lab mouse types. Our mathematical approach also allowed us to explore, in detail, the dynamics by which this competition within cells occurs. We were able to use our data rather effectively by having a statistical model that allowed us to reason jointly about a range of data sets. We found that the degree to which one population of mtDNA beat the other depended on how genetically different they were. We found that different tissues were like different environments: some favouring C over A and some vice-versa. This is perhaps surprising to some as this evolution in the proportions of different genetic species is not something we imagine occurring inside us, during our lives, and as something that might differ between our organs. We found several different regimes, where the strength of competition changes with time and as the organism develops: when our cells are multiplying faster they show a more marked preference for one of the species. We've shown our results to the UK HFEA in its ongoing assessment of these therapies, and you can read, for free, about our work called ``mtDNA Segregation in Heteroplasmic Tissues Is Common In Vivo and Modulated by Haplotype Differences and Developmental Stage'' in the journal Cell Reports here. Iain, Joerg, Nick. We found that one mtDNA type beat another in different ways across many different tissue type. Here, the height (or depth) of a column represents how much the mtDNA from a wild mouse wins (or loses) against that from a lab mouse in different tissues. The bottom row corresponds to the smallest difference between wild and lab mtDNA; the top row corresponds to the greatest difference.